Nearing 100 years old, Therese Michaud received recognition Tuesday afternoon, Feb. 5, at Ridgewood Estates, not only for her 79th anniversary of being a Sister of Mercy, but also for being the oldest living Sister of Wisdom in the United States. 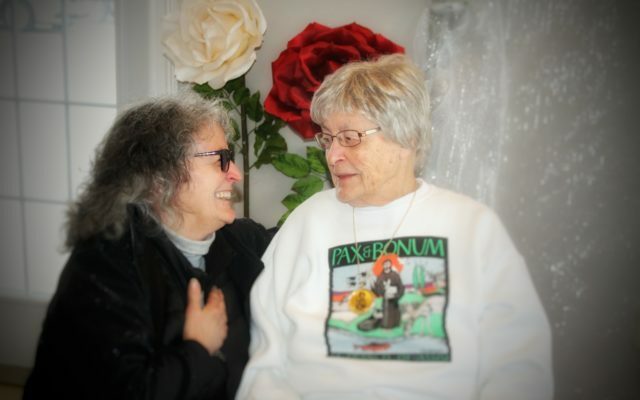 MADAWASKA, Maine — Nearing 100 years old, Therese Michaud received recognition Tuesday afternoon, Feb. 5, at Ridgewood Estates, not only for her 79th anniversary of being a Sister of Mercy, but also for being the oldest living Sister of Wisdom in the United States. The 97-year-old sister addressed a special gathering, and then all joined in the festivities with a root-beer-float social. Activities Director Paula Gendreau led the celebration. Michaud’s nieces Pierrette Soucy and Mona Lavoie sat the VIP section of the room and looked on in admiration and pride at their Tante Therese. To remember what she remembers at her age — I mean, it is better than us,” Soucy quipped after Michaud gave a full recount of her life journey. Michaud said her next life goal is to join up with the sisters in Canada. “And that is going to be very beautiful,” she said.